While here in Ohio, I had one specific thing I wanted to do in addition to dropping Older Daughter at her nanny school: visit Lehman's. Lehman's, as you no doubt know, is an enormous retailer of non-electric goods. 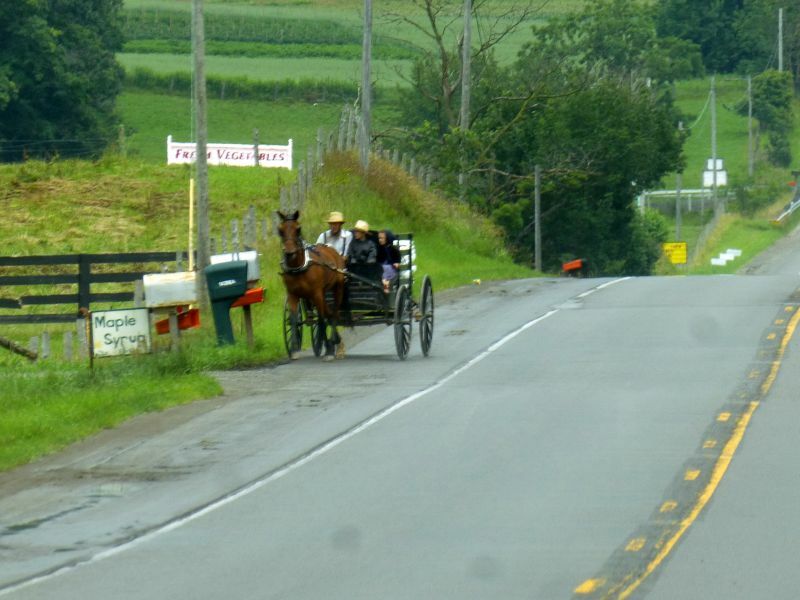 It began as a service to the local Amish population and its popularity has expanded in the last twenty years. We've been customers since the late 90s (we ordered a wonderful set of Lincoln Logs for the girls when they were very young, for example) and I've always wanted to see the store. So when I learned Older Daughter's school is only about a 90 minute drive from Kidron, the store's location, I actually delayed my return home for a day for the express purpose of visiting. In fact, I was looking forward to it so much I jokingly called it my Pilgrimage to Lehman's. I was anxious to see rural Ohio since so far I wasn't impressed with the urban areas I'd seen. (To be fair, I'm seldom impressed with any urban areas. I'm a country girl.) I couldn't see much of the terrain on the major highways since they were hemmed in by trees, so it wasn't until I got onto the rural two-lane roads that things started looking up. Ohio, I learned, isn't really big on road signs. Every crossroad is a tiny town with a name, but the names are seldom visible, so I blundered around a lot before I finally saw the sign for Kidron Road. 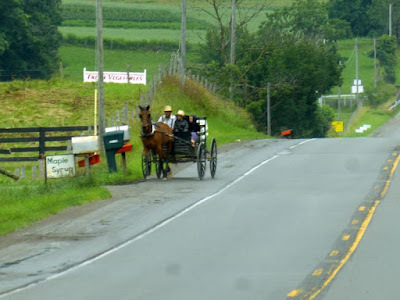 This is truly Amish country -- supposedly there are more Amish here than in Lancaster County, Pennsylvania -- and indications were everywhere. It should be noted many "English" are not above cashing in on the Amish reputation for quality products. I had no way of knowing which stores were actually run by Amish versus English. At last my destination hove into view. It was crowded with tourists, but both the store and its parking were spacious. I walked into the enormous building, and all I can say is...wow. Just wow. The store is divvied into categories. I started by walking through the stoves area. On the floor they had the models which were for sale, along with every possible accoutrement (stove pipes, cleaning brushes, etc.) to go with them. Since this area required detailed knowledge of installing stoves and other heating devices, there was a counter with specialized sales people to help customers. I overheard some of the conversations and yes, the sales people knew what they were talking about. Ranged in niches on the walls above the room, there were numerous antique stoves on display. The only pity is they weren't accessible at floor level for people to admire. It was every bit as good as a museum. The whole store was like that -- museum-quality antiques were on display everywhere. Here's our Baker's Choice model cookstove, the one we have in our house waiting to be installed. I wandered into another area of the store and found myself in a darkened room with wood carvings on display around the walls. "Wood carvings" hardly do these works of art justice -- they were astoundingly detailed and in three dimensions. Numerous signs indicated photography was permitted, so I took advantage of that. Remember, these are not flat relief-style carvings -- these are actually in three dimensions (which is what a photo can't convey). They were more like wooden sculptures. Amazing, just amazing. At last I pulled myself away from the carvings and went to explore the rest of the store. The Lighting Department was particularly attractive. I got thiiiis close to buying this hanging lamp -- the price was right and I've always had a thing for hanging lamps -- and the only thing that deterred me was knowing I couldn't pack it in my suitcase for the trip home without it breaking. In the coffee and tea section, I was amused by this sign. It seems Lehman's is quite taken with Lord of the Rings -- I heard snippets from the movie score playing over the store's sound system a few times, and they had a line of tea packaged specifically for fans. I bypassed Gandalf the Gray tea (since none of us like Earl Gray) but purchased a box of Bilbo Baggins Breakfast Blend for Older Daughter (sadly, I didn't take a photo of the box because it was charming). Needless to say, the Toy Department was wonderful. I've always enjoyed toy stores that aren't enamored of the plastic trendy junk. I didn't realize this, but apparently Lehman's had a horrific flash flood in 2011 that devastated the store. After having witnessed some of the rainfall this part of the country can get, this doesn't surprise me. In several spots around the store, the water line was marked. They also had a wall of newspaper and magazine publicity from over the years, including the flood. These are closeups of the newspaper photos depicting the cleanup. Holy cow, what a mess. Needless to say, I lingered a long time in the book department. I didn't buy anything because I wouldn't be able to shlep it home easily, but in fact I was gratified by how many of the titles we already owned. Another example of Lehman's status as a quasi-museum: a wall full of antique miniature sewing machines. Lovely. So what did I purchase at the store? Besides tea for Older Daughter, Younger Daughter requested a bonnet (I found a sunbonnet) and Don requested a hat (I purchased an Amish men's straw hat). 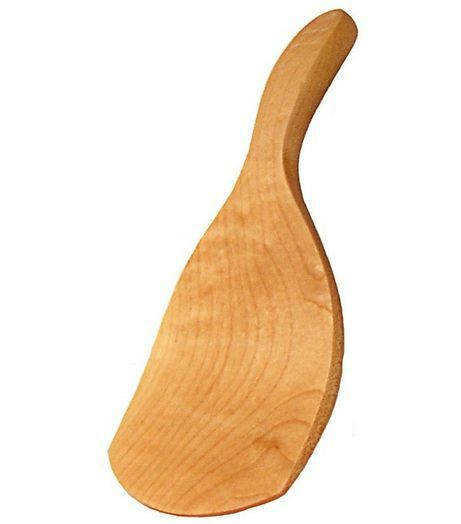 Ironically the one thing I wanted for myself was a curved butter paddle and -- wouldn't you know? -- the store was out of stock. They had two left in the warehouse, so I purchased the paddle and they agreed to ship it from the warehouse at no cost. I left the store deeply satisfied. What a wonderful place. Then a funny thing happened. I was sitting in the car with the windows open, looking at a map, when I heard a rapid clip-clop-clip-clop coming down the road. An Amish buggy. I grabbed my camera and jumped out of the car, but the driver was already out of sight. 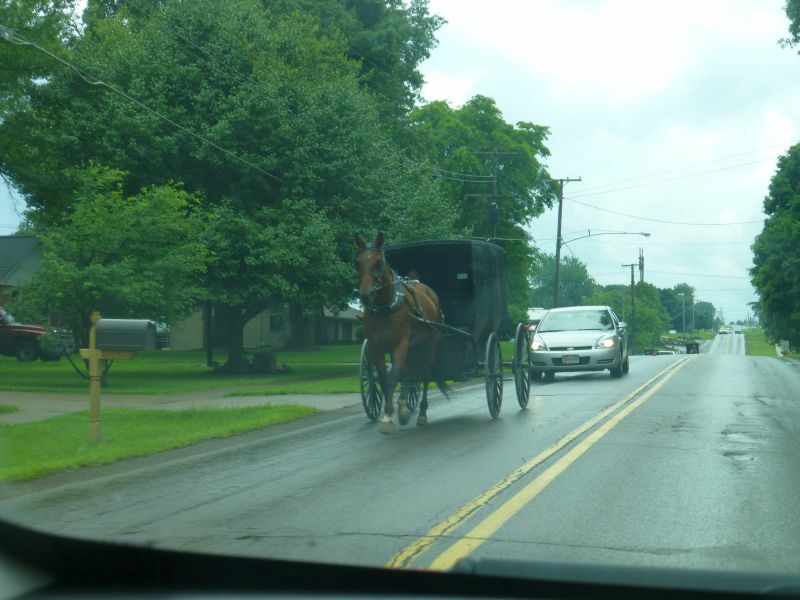 I was disappointed, for some reason thinking I'd missed my only opportunity to photograph a genuine Amish buggy. But the driver turned around and came back down the road a few minutes later, and this time I was ready. 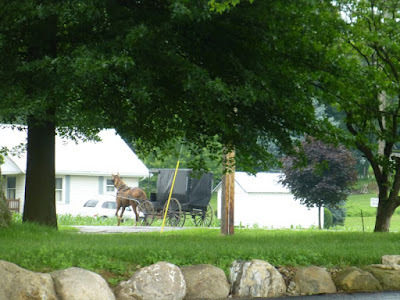 I know I was gaping like a tourist -- well okay, I am a tourist -- but I've never seen a real Amish buggy before. It was beautiful. I wasn't in a rush to get back to the hotel room -- Older Daughter wasn't expecting me until 6 pm or so -- so I avoided the highways and instead meandered back toward the hotel via back roads and smaller routes. I saw many buggies and wagons along the way. It was something else to see the Amish just going about their ordinary business. On smaller byways, they used the roads. On busier thoroughfares, they used the shoulders, which were clearly made wide to accommodate wagons. I admired the calmness of the horses, who never shied even when semi-trucks roared right by them. I saw what I thought was a child walking along the side of the road pulling a wagon, and managed to snap a photo. It wasn't until after I passed that I saw it wasn't a child but a grown woman, a dwarf. (I won't show the photo out of respect for the Amish preference not to have their faces shown.) It brought to mind what I'd heard about the Amish having a higher number of genetic abnormalities due to a relatively small population. The drive back to the hotel was lovely. I snapped random photos as I could of pretty farms or homes. One place had airplane hangers -- for crop dusting? I positively drooled over this collection of barns. As I left the lovely rural areas behind me and entered urban chaos once more, I had a thought about Ohio. Granted I've seen just the merest sliver of the state, but it strikes me that even outside the urban areas, Ohio is very crowded. In Idaho, towns are separated by vast open spaces with maybe a house or two at wide intervals. In Ohio, every crossroad (almost literally) has a cluster of homes and stores dating back a century or two (many had signs indicating such-and-such township was established in 1810, or 1817, or whatever). Coming from the relatively recently-settled west, these places were venerable and beautiful. But they're everywhere. Ohio has no unsettled locations. Massive highways criss-cross the slower rural regions, and large cities are speckled all over. It seems there are very few wilderness areas in the state where someone can be a long distance from anyone else. Or am I drawing the wrong conclusion? One thing's for sure, I wouldn't mind spending more time exploring the state, but I won't have the chance since I'm flying home today. Still, I'm glad to see what small part of it I did. Holy cow, what a trip this has been. Join me as Older Daughter and I make our way to Ohio. We started by renting a car in Coeur d'Alene and driving to Seattle. It was far cheaper (as well as a direct flight) to fly from Seattle to Cleveland than it would be flying from Spokane (which, we learned, would have necessitated two or three layovers). So drive we did. Notice the dry, desert-y landscape. Most people don't realize how much of central Washington features this kind of terrain. We saw lots and lots of enormous dust devils, hundreds of feet high. We stopped at a dramatic overlook on the Columbia River. It was bakingly hot, dismally hot. You see that distant bridge across the river? Well, we crossed it next. No problems going across -- for US. But traffic in the opposite direction? Oh my goodness. Road work on the bridge reduced traffic down to one lane, and it was backed up for MILES. How many vehicles were overheating in that hot sun? I can't even begin to guess. I didn't keep exact tabs, but I'm guess it was eight or nine miles of backed-up traffic -- enough that, on my way home, I'm going to avoid this particular route. Eventually we made it over Snoqualmie Pass and dropped down the western slope of the Cascades, where things were much greener and more dramatic. Oh, and a bit cooler too. And of course, I hit Seattle just at the end of rush hour traffic. Then after waiting a couple of hours for the ticket counter to open at the airport, we hit rush hour traffic for checking in as well. Oh, and then security. By this point we were pretty wiped, having been traveling (which included waiting time) for eleven hours. It was nice to see some homey rocking chairs in the airport, looking over a massive glass wall to the tarmac. The flight was a red-eye departing at 11:30 p.m. (understand I'd been awake since 3:30 a.m. -- I'm naturally an early riser). It was interesting to see the city lights from above. Needless to say, neither of us slept worth beans on the flight beyond fitful dozes. The flight was uneventful, but it landed around 7 a.m. at an amazingly disorganized airport, since Cleveland was apparently undergoing a great deal of renovation work and had poor signage. After a half-hour search for the rental car desk, we learned we had to take a shuttle several miles off-site to rent a car. Are we having fun yet? Chagrin Falls was disappointingly blah, particularly after hearing everyone praise its beauty. Naively thinking there wouldn't be a problem to find lodging, I hadn't booked a hotel in advance and quickly learned my mistake. After attempting five hotels (starting at the cheapest and working my way up), I finally found a room for a staggering $150 for a single night. By now desperate for anywhere to rest, I took the door card and we stumbled upstairs, tired beyond thought. Older Daughter took a shower and then crashed on the bed and slept for awhile. We couldn't check her into her dorm until 3 p.m., so we finally wound our way through several miles of verdant hilly highway toward the school, and made an important discovery. The hotel wasn't in Chagrin Falls -- it was (I think) either Beachwood or Woodmere (signage isn't always clear). The town of Chagrin Falls was several miles away, and oh my goodness, it was gorgeous. We had half an hour to kill, so we decided to explore the town a bit. It just happened to be the half hour when the rain ceased (notice the ominous clouds overhead). Chagrin Falls is the location -- no surprise -- of the waterfall that bears its name. It was massively full enough to attract even the locals to gape. It was muddy from the onslaught of rain, and we thought it looked like the waterfall in Charlie and the Chocolate Factory -- chocolate churned by waterfall. The noise was thunderous, particularly on the observation platform that was practically in the water. The falls have two tiers, and we agreed we wouldn't want to be on this porch hanging precariously over the upper tier. We enjoyed ourselves very much as we walked around the small enclave and admired the sights. The school is two buildings (converted houses) and a sign welcomed incoming students. Then it was time to go check Older Daughter into the dorm -- just as the rains moved back in and it poured once more. We got to the dorm a few minutes early. A fast dash to confirm the doors were locked left us as drenched as if we'd stepped into a shower. So we sat in the car, mopped our head and faces, and watched the staggering downpour. Just when I commented that it couldn't possibly rain any harder -- well, it rained harder. At last the rain eased up about the time the administrator unlocked the dorm, so nobody's belongings got soaked. The dorm is very basic and very clean. Older Daughter is sharing a room with a 26-year-old woman who was also homeschooled. There are only seven students this term, and all seem very kind, cheerful, and grounded. There are two small kitchens, a common room, several bathrooms, etc. Older Daughter made up her bed, put her clothes away, and set up a corner of the dresser with her favorite tea cups and Terry Pratchett books. The administrator also had a meeting with all the new students (non-students were asked not to attend), so I went back to the hotel and allowed our daughter the dignity of entering her new life without mommy tagging along. In the evening I picked her up for dinner and we shopped for the toiletries we didn't want to bother shipping. She was getting acquainted with her new housemates and liked everyone -- as I said, they seemed like a solid, grounded group of young women -- and she was optimistic. The only cloud hanging over both of us is our upcoming parting. More later -- still tired from the trip -- but it seems Older Daughter is launching into a very nice life. A love story: "We are a team." Is human nature still basically good? Are the bullies backing down?